I've driven by that sign on Pinto Basin Road many times over the years, and each time it's tempted me to stop and wander off into the desert in search of the elusive watering holes so-named. But up until recently, I'd never heeded the temptation; I just continued on my way, oblivious to the great hike that I was missing. While looking at some maps, searching out places to visit on my next trip to J Tree, I saw the name Twin Tanks and remembered all the times I'd driven past their sign without stopping. So I decided to do some research and see what I could discover about the site. As it turns out, there isn't much information available about Twin Tanks. 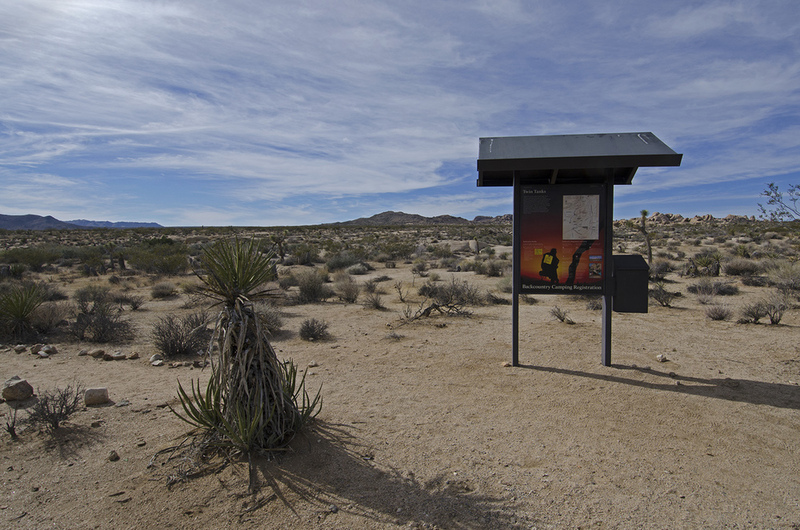 The sign on Pinto Basin Road is almost all there is. The Dzrtgrls have a post on their site with some pictures of the Tanks and surrounding area, and one of my trail books has a brief mention of the hike to Twin Tanks. That was it. But I enjoy a challenge, so I headed out to see if I could find the twins. 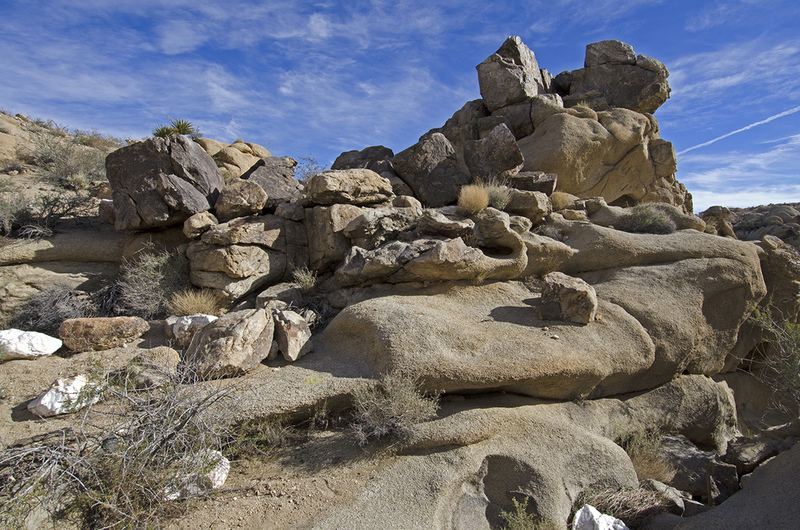 There's no trail to the tanks, but my trail book said they could be found along a bearing of 245° from the backcountry board located at a small parking area off Pinto Basin Road, near White Tank campground. 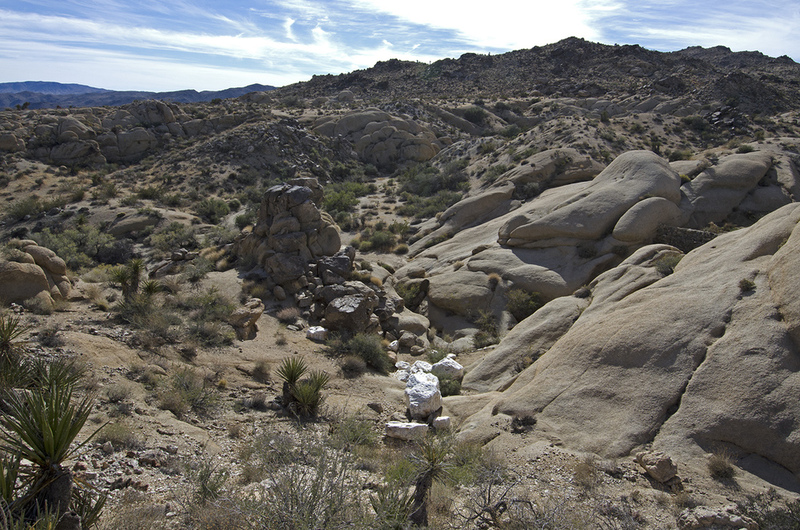 I also knew there were some large, white quartz boulders atop a small hill very near to the tanks. I've found places before with less information, how hard could it be? Well, it's actually pretty easy with those two clues. 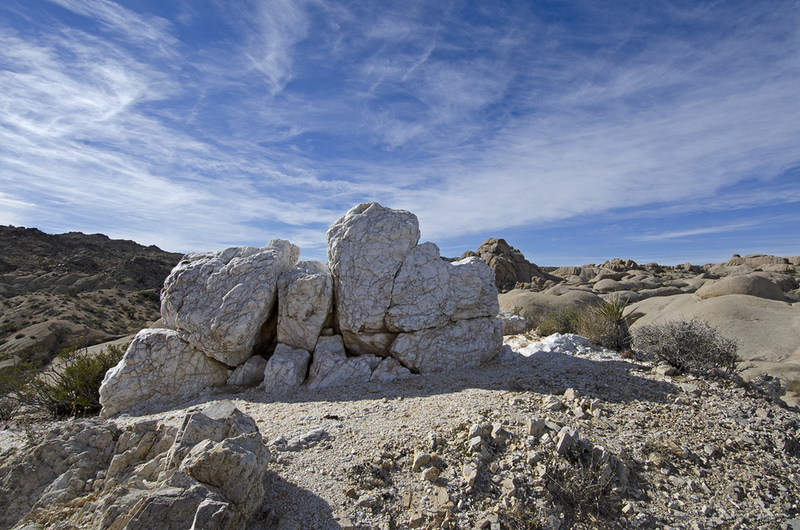 The big chunks of white quartz. Standing at the backcountry board, I took a compass bearing of 245° to get the general direction of where I needed to go and squinted into the distance. 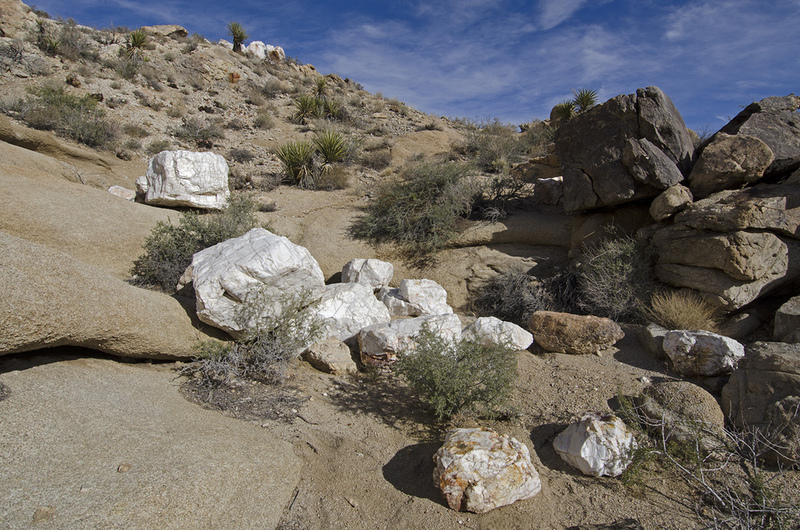 If you have very good eyes, you'll be able to see several big chunks of white quartz about a mile away, sitting atop a small hill. I had to use my binoculars to find it, but it is visible from the parking area. And that's the landmark I needed. 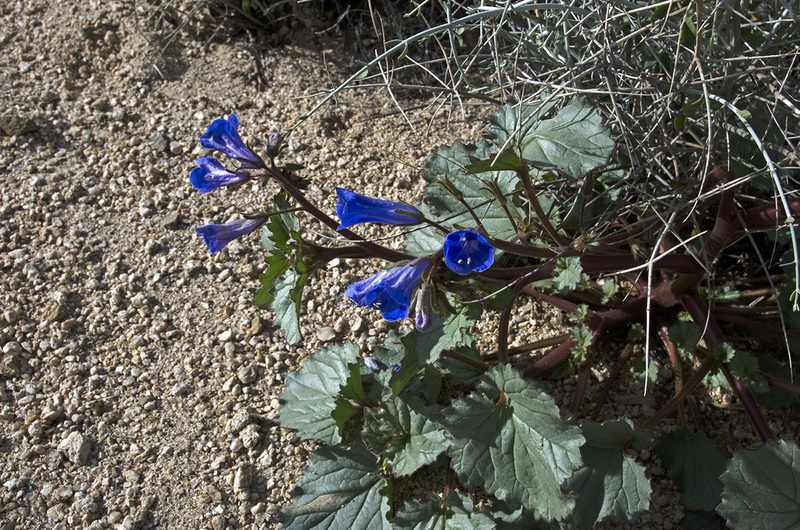 I set out cross-desert hiking, climbing a few rocks, skirting a few small washes and avoiding cactus. My landmark would disappear every now and then, hidden by some small hill or turn in a wash, but it always reappeared as I managed to stay on course. 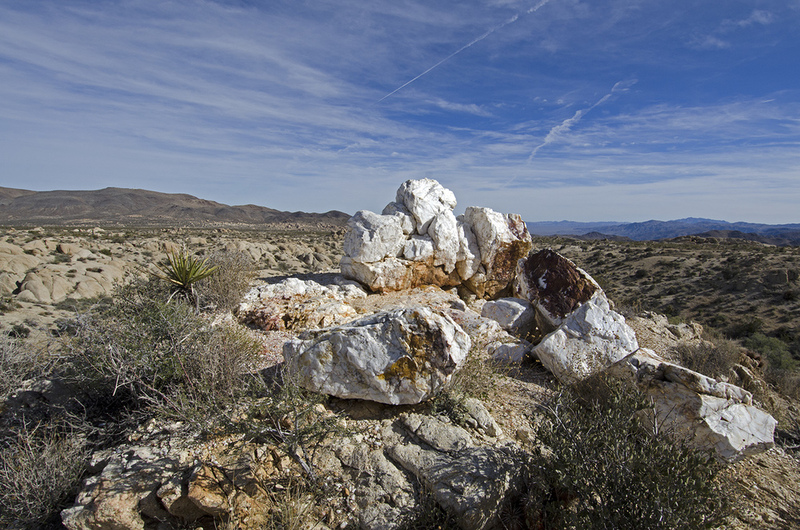 And about twenty minutes later I was standing next to a huge outcropping of white quartz, with a great view of the valley behind me and rocks before me. I probably could have followed the main wash to arrive at the same spot, but the problem with that is, the main wash isn't always easy to keep track of. Sometimes it will narrow down and other washes entering it will pretend to be the main wash, to mislead you because they're sneaky. It gets confusing; I recommend the cross-desert method for hiking to Twin Tanks. Twin Tanks is a bit of a misnomer; there are a lot of tanks out here, natural catch basins that will hold rainwater and runoff, sometimes for a long period of time. 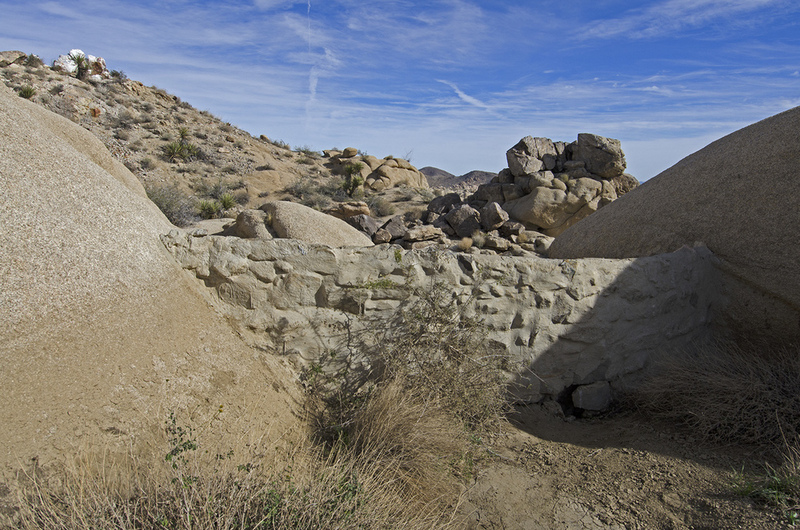 The wind, the rain and time can carve out some large holes and basins in the White Tank Monzogranite. Judging by the piles of sand underneath a few of the dry waterfalls I found, this area can get some serious watering. But the area got its name from two man-made catch basins, or tanks. Cattle ranchers way back when built two dams in this area to help store water for their stock. The one I found most interesting is located just a little ways southwest of the giant quartz chunks. The dam sits high above two large, natural tanks and is about ten feet tall, constructed of stone and cement. The second tank is roughly 100 yards or so to the northwest of the quartz pile. 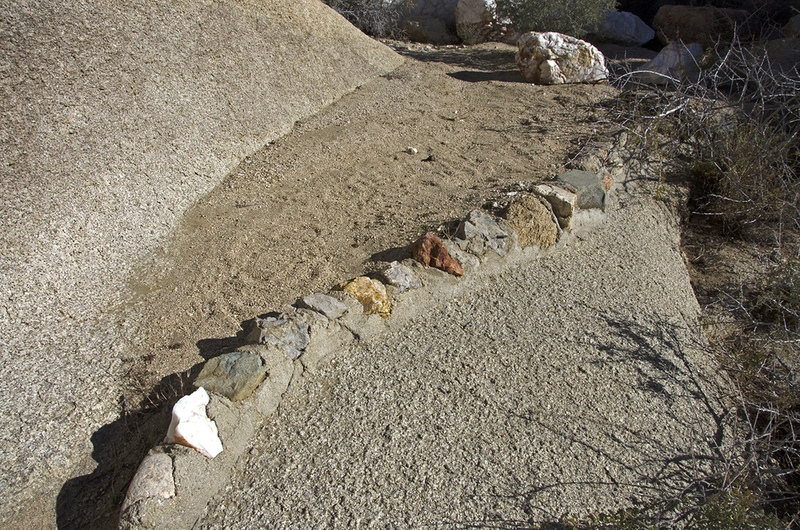 It is a smaller, shorter dam made mostly of cement. Along the top at one side, Bill Keys inscribed his name in the cement, so my guess is that he built this one. I'm not sure if he had a hand in building the other but would wager that he did. An interesting side note on the tanks: both of the dams can be seen from space. Another side note: both dams have two or three Tinajas below them. The round-trip hike to Twin Tanks is approximately two miles and could easily be done in less than an hour, but I spent several hours exploring the surrounding washes and rock formations; if you enjoy hiking in J Tree backcountry without seeing another person all day as much as I do, it would be easy to turn this into an entire day trip. I'm sure there are hidden gems in the area just waiting for me to find on my next trip to Twin Tanks. The Twin Tanks are out there!